And the Southland? 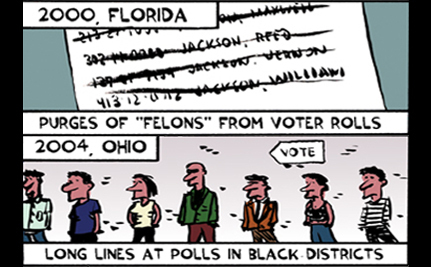 In 2000, Florida Secretary of State Katherine Harris purged tens of thousands of African-Americans from voter rolls, labeling them “felons” when their only crime was VWB: Voting While Black. All ”” every one ”” were innocent. And again, in 2012, Florida Governor Rick Scott targeted 180,000 voters, mostly Latinos, as illegal “alien” voters. The Governor, when challenged by the Justice Department, cut the “alien” list to 198 but in the end, could only produce evidence against one. As King admonished us, we must not be satisfied when we see Black folk, a half century after the passage of the Voting Rights Act, stand in line for six hours to vote whether in Miami or in Cleveland. Joining Palast as initial co-signers of the petition are Dr. Charles Steele, Jr., CEO, Southern Christian Leadership Conference, who succeeded Dr. King as President of SCLC and one of the original Freedom Riders, Dr. Bernard Lafayette, Jr., co-founder, Student Nonviolent Coordinating Committee.